Echo de la Jeunesse, an NGO founded in Lomé in 2006, helps underprivileged children and vulnerable populations. It runs projects in the fields of childhood education, health, culture and the environment. Since its foundation, Echo de la Jeunesse has helped fund, amongh others, the construction of a water tank and the renovation of a school, the acquisition of books for a library, the distribution of educational equipment for a local school, and it has put in place community awareness programs to help fight malaria. In fall 2013, a first container was shipped to Togo. It carried Cyclo Nord-Sud’s 45,000th bike and was shipped to The MECANO Project. 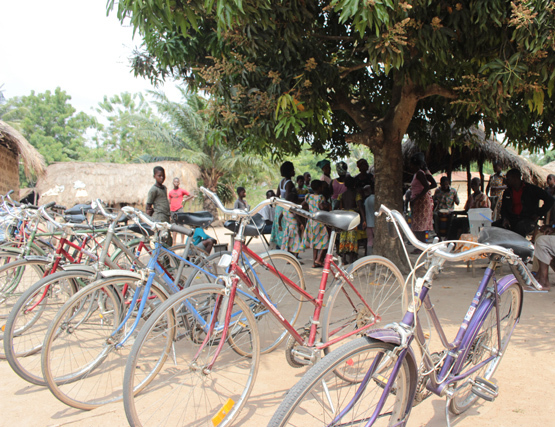 Since then more than 2,000 bikes have been sent to Togo. The MECANO Project and Cyclo Nord-Sud have also entered a new stage of cooperation with the construction of a community center in Sanguéra focused on the distribution and sales of bicycles. The center will include a bicycle and spare parts shop, including a warehouse, a repair shop, and a bicycle mechanic training school. Some 900 people will benefit each year: those who purchase a bicycle or parts, and a dozen youths who will take part in each training cohort. Massanvi is one of those beneficiaries. To hear in her voice what the program has done for her, please click here.